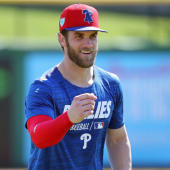 The Phillies optioned Pinto to their minor-league camp Saturday, Matt Breen of The Philadelphia Inquirer reports. Pinto was removed from consideration for a bullpen role with the big club after conceding three runs on seven hits over four innings in Grapefruit League play. The fact that the right-hander maintains a spot on the Phillies' 40-man roster helps his case for earning a promotion to the big club later this season if he performs well with Triple-A Lehigh Valley.